Chip is a cutie who knows his name and will look when called! Chip is 3 1/2 years old and loves playing with toys! He enjoys toys that make sounds, he laughs loudly, and gets excited when people play games with him. Chip knows how to get adults’ attention and always claps his hands happily when his needs are met. 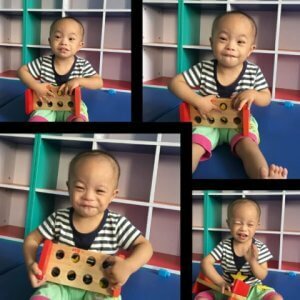 Chip can walk on his own, has good fine motor skills, can pick-up small balls with his thumb and index finger, and receives 5.5 hours a day of physical therapy and developmental training. He is cared for by his foster mother the rest of the time. Chip is a sound sleeper, good eater, and likes playing outside.